How is LiDAR Data Used to Protect Water Quality in Minnesota? High resolution elevation data collected using LiDAR technology has been available for parts of Minnesota for several years, much of it made possible by funding from the Clean Water Fund of the Clean Water, Land and Legacy Amendment. The following examples illustrate how LiDAR data is already being used to protect water quality in Minnesota. As this data becomes available for more areas of the state, the uses are expected to increase exponentially. Click on any graphic to see it full-size. 137Cs is a radioactive isotope whose only source is nuclear fission. The isotope bonds strongly to soils and “labeled” the soil surface during aboveground nuclear testing in the 1950s and 1960s. 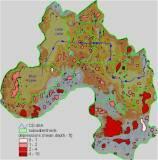 Measuring the 137Cs content of soil profiles serves as an effective tracer for soil movement on decadal scales. The picture is an example output from a regression model developed by researchers at the University of Minnesota. Based on digital terrain attributes, the model result shows localized areas of potentially high erosion rates while the overall average field erosion rate is 3 tons/acre/year. When applied to cultivated landscapes, the regression models create maps of predicted long-term rates of soil erosion or deposition. These maps will be useful to Board of Water and Soil Resources personnel, soil conservationists, and other local government unit personnel to help identify which portions of the landscape would benefit the most from perennial vegetation conservation practices. 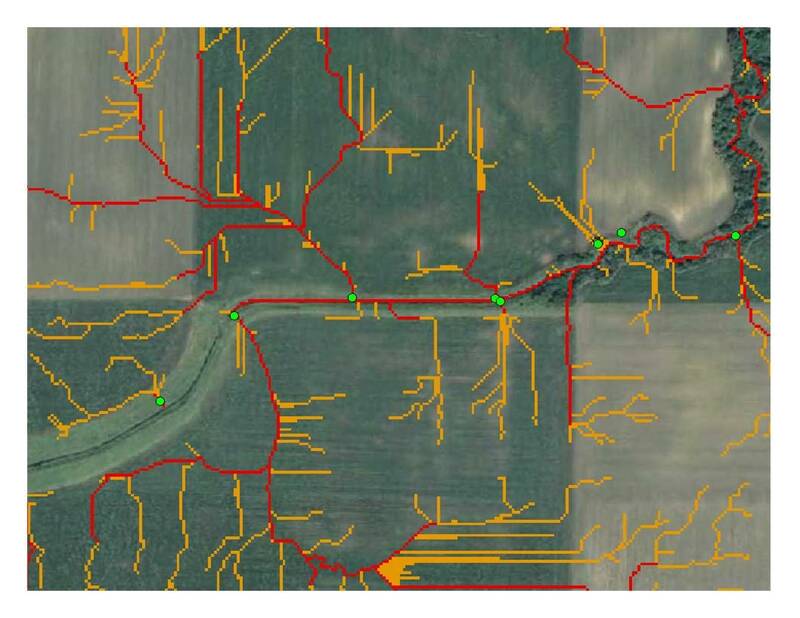 In the Seven Mile Creek watershed in Nicollet County, LiDAR data was used to reduce time and labor to find likely sites of gully erosion. A terrain model and water routing computer program predicted where water would flow across fields; the points at which these flows entered a ditch or stream were the most likely locations for gullies to form. 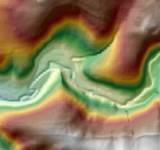 Field inspection verified that the model accurately predicted where gullies were forming. The map to the left shows the water flows as orange and red lines (red lines are higher flows); sites of field-verified gully erosion are shown as green dots. Performing an on-the-ground inspection to locate and map gullies in the same small watershed required $10,000 in labor and other costs. Scaling up ground inspections to the size of Nicollet County would cost more than $100,000 and to the size of the Minnesota River Basin, $4 million. On-the-ground work at that scale would require several years to accomplish with available trained personnel. 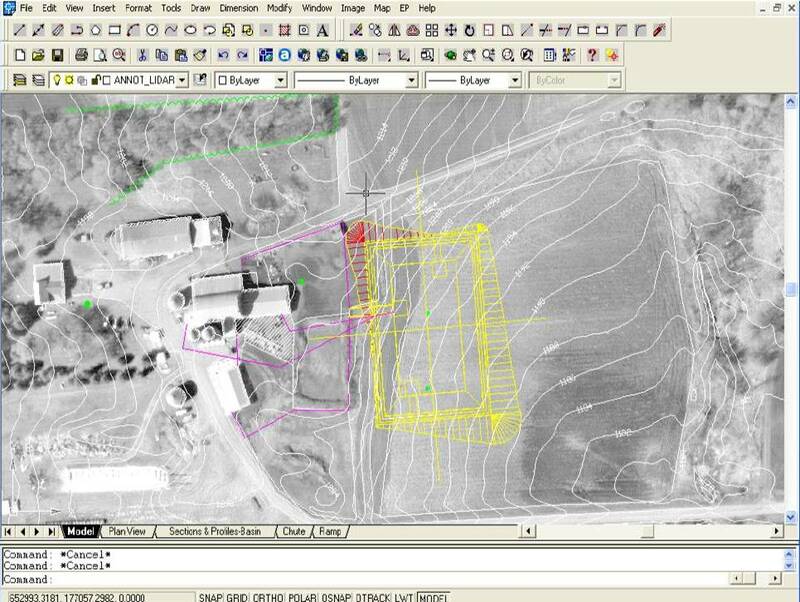 High resolution topographic data with the terrain models would eliminate much of the reconnaissance work and re-focus valuable personnel field time on designing and installing targeted solutions to reduce or prevent erosion. NRCS is using LiDAR to help identify ephemeral erosion sites and to produce slope estimates to use in computing the amount of erosion (determined using the Revised Universal Soil Loss Equation, or RUSLE). LiDAR will also be used in the hydrology/hydraulics model which in turn will be used to estimate potential streambank erosion sites. 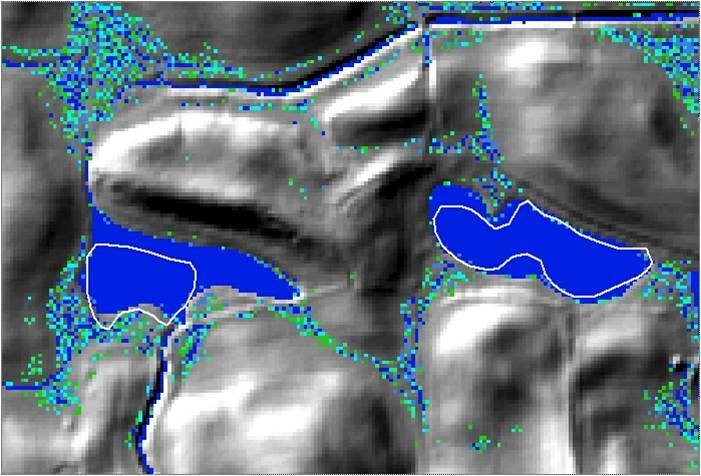 High resolution topography can be used to very accurately identify the size, depth and location of depressions in the landscape. 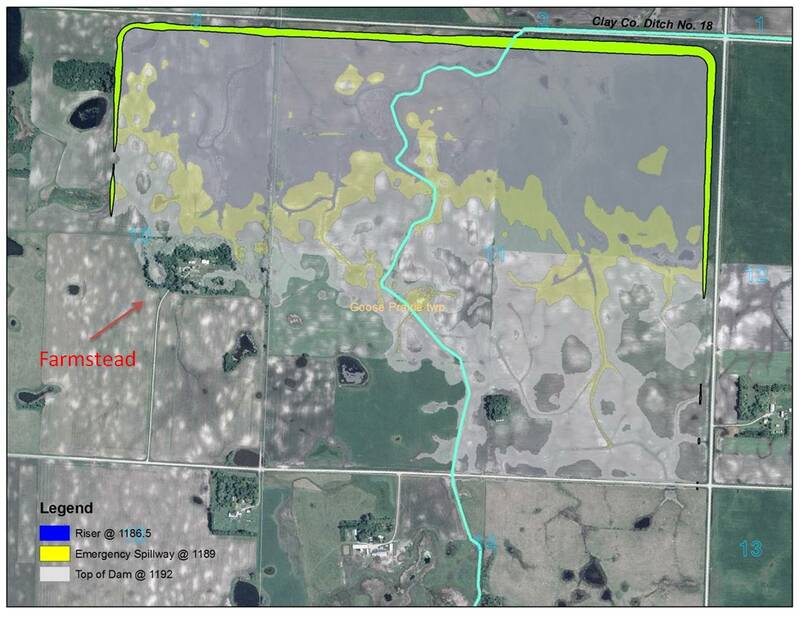 The graphic shows depressional areas where water could be stored in the area drained by Nicollet County Ditch 46A, within the Sevenmile Creek watershed, which drains directly into the Minnesota River. Using the depression information, hydrologic modeling can then be done to identify specific locations within a watershed for temporarily storing runoff to achieve the greatest reduction in peak flows. Reducing peak flows from this watershed will decrease the amount of sediment and nutrients delivered to the Minnesota River. This is for one project in a 9 square mile watershed. The Minnesota River Basin includes 15,000 square miles in Minnesota. Scaling up savings of this magnitude equals $38 million in potential savings if similar projects were completed throughout the watershed. The Stearns County Soil and Water Conservation District used LiDAR-derived elevation data to speed the siting and design of a manure storage facility. Such facilities protect water quality by allowing farmers to avoid winter application of manure which can be washed away in spring run-off. The topographic data allowed staff to quickly assess the entire project area to select preliminary sites; on-the-ground surveying was then targeted to these sites. Once the final site was selected, staff compared cut-and-fill estimates obtained using the computer model with those obtained using on-site surveying; the figures were remarkably similar, within 3-7 percent. 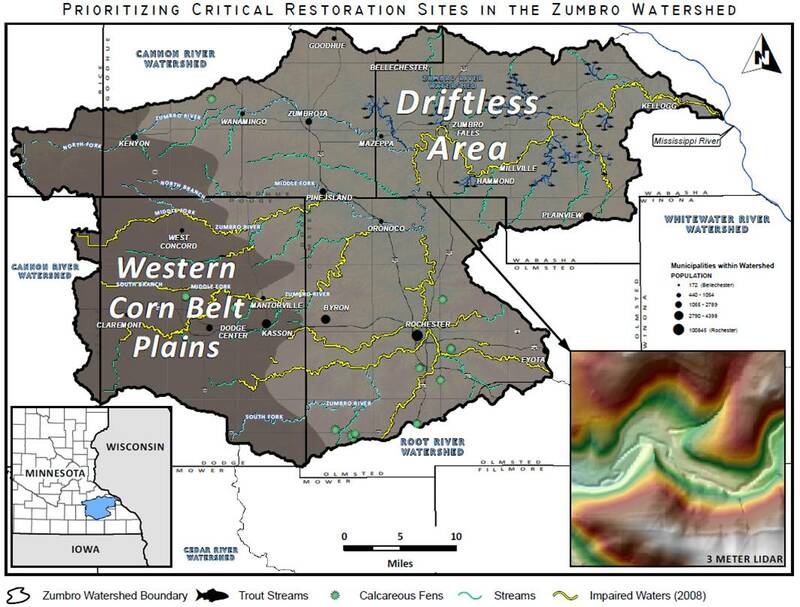 A proposal to comprehensively identify and rank critical sources of erosion and runoff in the Zumbro Watershed has been recommended for funding by the Legislative-Citizen Commission on Minnesota Resources (LCCMR). The project would use LiDAR and other GIS data and precision conservation tools to prioritize restoration and protection projects with the highest cost-benefit. Once the top 50 source locations were identified, staff would develop and use an in-field assessment technique to further evaluate and plan best management practices appropriate for those locations. LiDAR will assist in defining critical runoff areas, and guide the placement of BMPs including terraces, sediment and water control structures, grassed waterways, and grassed buffers. Click on either graphic to see a map of the whole watershed. 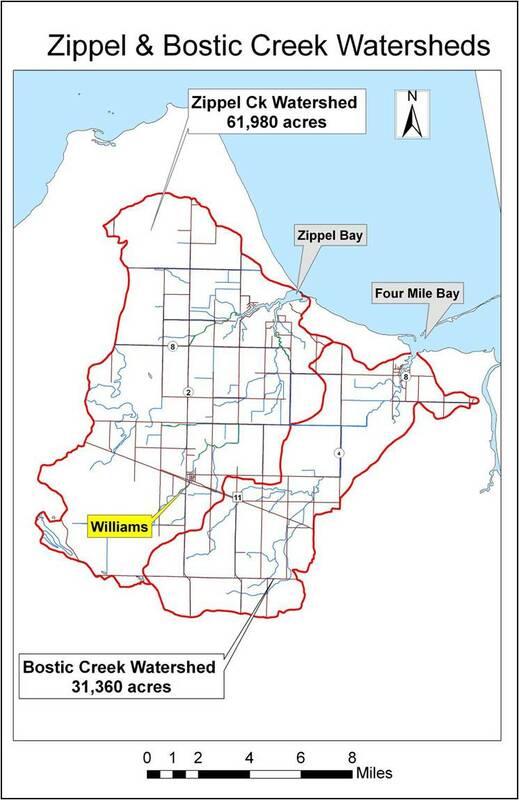 As part of an on-going project to update Minnesota's National Wetland Inventory (NWI) data, a pilot study was conducted to develop a wetland probability map for the Knowles Creek Watershed in Rice County, Minnesota. Using terrain variables derived from LiDAR and soils data, two models were developed to create continuous wetland probability maps for the study area. 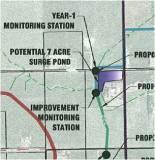 The graphic to the left compares original NWI wetland boundaries (white lines) with the output from one of the models (blue-green colors). Blue areas have the highest probability of being wetlands; green areas have a lower probability. The background is a hillshade created from LiDAR data. 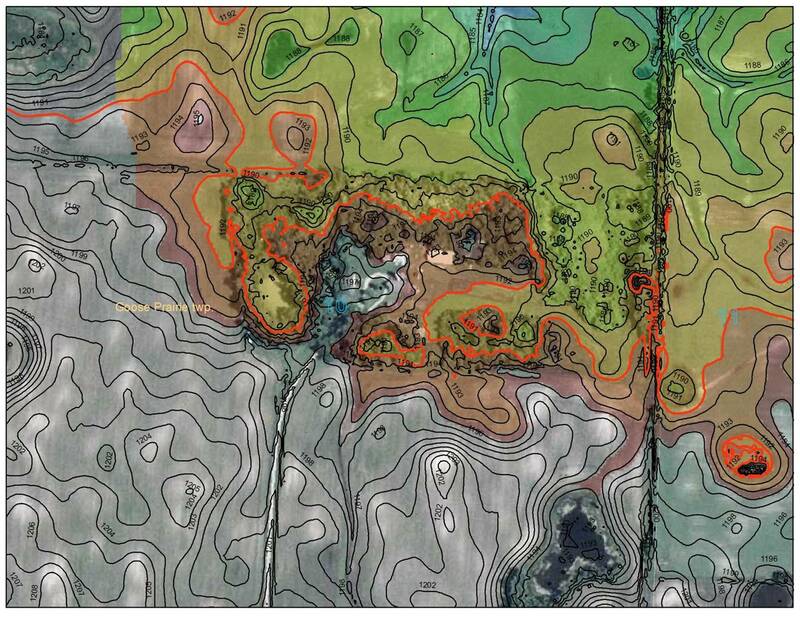 Example Impoundment Site: To design an impoundment site in an area along Clay County Ditch 18, accurate topographic data was essential to avoid flooding a farmstead. 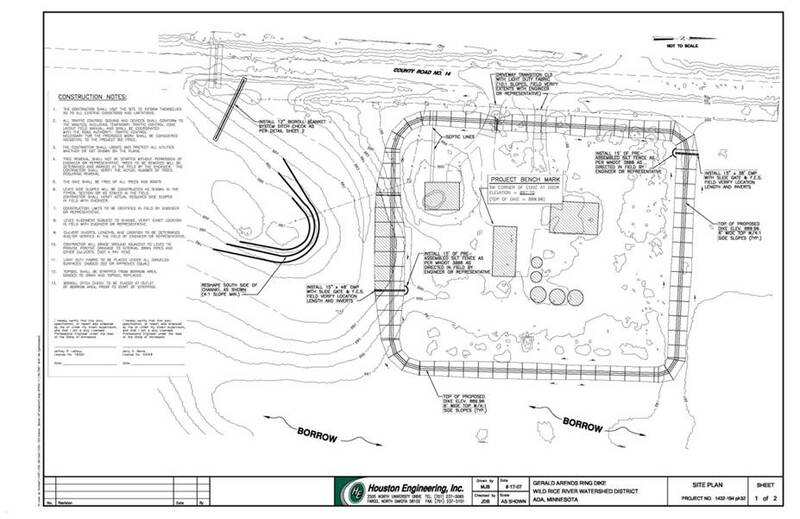 The graphic to the left uses red lines to show the elevation contours around the farmstead at 1,192-feet, the proposed level of the top of the dam. The analysis confirmed that much of the property would be flooded at that level. 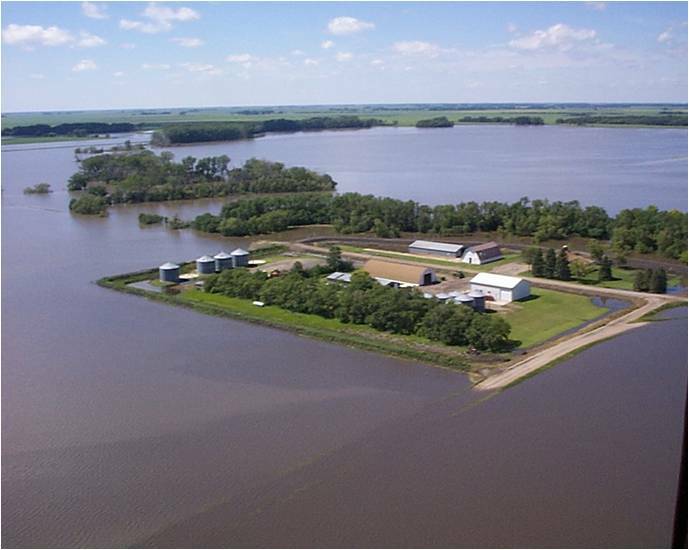 The graphic to the right illustrates the lands flooded at different water levels; in the final plan, an emergency spillway ensures a maximum level of 1189 which will not flood the farmstead. 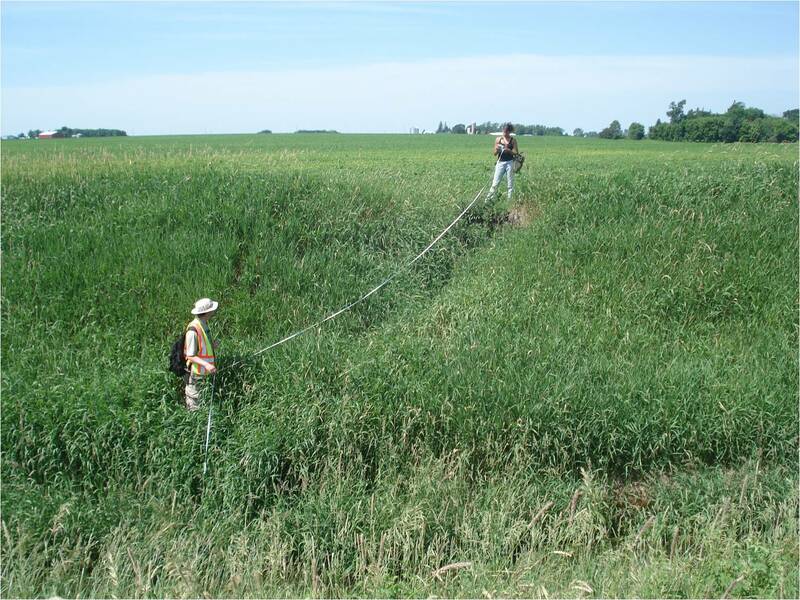 Houston Engineering used LiDAR elevation data when designing a ring dike to protect a farmstead from flooding in the Wild Rice Watershed. High-resolution topographic data was needed to accurately locate, size and align the structure, to estimate material quantities and total costs, and to meet permitting and mitigation requirements. LiDAR-based flood-peak inundation maps and water-surface profiles were created for the U.S. Geological Survey report, Floods of September 2010 in Southern Minnesota. The maps and profiles were constructed using GIS by combining high-water-mark data with the highest resolution digital elevation model data available. The flood maps and profiles show the extent and height of flooding through the most severely affected communities. These maps are used by Federal, State, and local agencies to make informed decisions in meeting mission requirements related to flood hazard mitigation, planning, and response. For example, the Federal Emergency Management Agency (FEMA), Minnesota Department of Natural Resources, Minnesota Department of Public Safety, and Minnesota Homeland Security and Emergency Management need timely information on the magnitudes and frequency of floods to help respond to flood damage, enhance emergency response management, protect infrastructure, provide recovery guidance from the National Flood Insurance Program and State regulatory programs, and plan for future flood events.